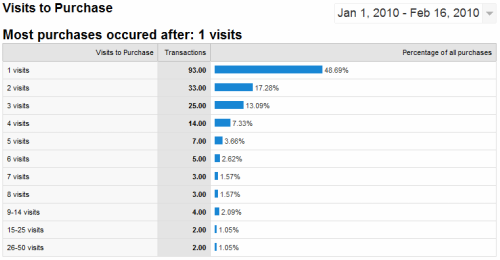 Recently, I have found myself talking quite a lot about tracking whole visitor paths in Google Analytics. Rand and I discussed the issue in a Whiteboard Friday kill the head or chase the tail and I covered how to get past last click attribution in a subsequent post. These have tended to cover the why and the (broad-brush) why. If you're interested in what first touch, last touch or multi-touch tracking is or why you'd want to do them, the resources above are a good place to start. The point is not what those exact values are, but simply that a significant number (in this case more than half) of all conversions come from visits that aren't the first! Today's post, however, is all about the details: how to get first touch tracking working to get you actionable data about real acquisition costs from Google Analytics. Note that this is going to set custom variables. If you are already using this functionality, you should be very careful with how you integrate this. Oh, and all of this is provided as is, with no warranty. I hope it will help you out, but only you are responsible for changes you make to your website and tracking code. By default, GA attributes conversions to the last touch - i.e. the source of the visit that led to the conversion. I'm going to show you how to get the source of their first visit to your site. It's a little clunky at the moment and I want to refine it a little to cope better with combinations of Google Analytics and Website Optimizer. If anyone has any good ideas for this, feel free to drop me a line or raise issues over at Google Code. Make sure you use your own UA-XXXXXXX-X identifier string! - l : original landing page (no query string) - s : original landing page query string - r : original referrer - q : if q=keyword+keyword is found, this contains that part of the referrer (it's actually more complicated than that - I have taken the full list of keyword delimiters from Google help and attempted to pull them out into the fourth variable in case the full referrer is truncated by the character limit). The detail of this is probably best reserved for another day / another post, but suffice it to say that I have found that custom reports exported to Excel are probably the best way of analysing the data this method produces. Far be it from me to tell you what reports to create, but I suggest something like conversions or revenue by original referring keywords might be interesting! I have found the Visitors --> Custom Variables report in GA to be flaky at best. I would advise avoiding that and creating your own reports. Work a tiny bit of Excel magic. Just paste this formula into an empty cell and place the information you want to decode into cell A1. Manipulate as necessary. You're welcome. And yes, I'm a (tiny bit) sorry for the nastiness of that formula. > Last-click attribution is like selling Alonso because he doesn't score enough goals. On that note, I'll leave you to go ahead and implement and let me know what you think. This documentation also appears on the Google code wiki.